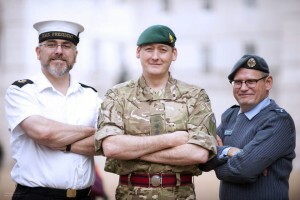 Civil Service Reservists: Leading Hand Chris Jones, Captain Olaf Dudley and Senior Aircraftman Andrew Horton (left to right) at Horse Guards Parade in London. Over 20,000 men and women, including many civil servants, are already fully trained members of the Reserve Forces. The Reserves offer a variety of rewarding roles in the Royal Naval Reserve and the Royal Marines Reserve, the Army Reserve and the Royal Auxiliary Air Force, training and preparing to work alongside the Regular Forces. So, if you’re thinking of taking a more adventurous turn in your life, learning new skills that will improve your employability and enhance your Civil Service career, why not scratch that itch and join now, rather than regretting it later. To help you make up your mind, here are 10 surprising facts about joining the Reserve Forces. They're based on the questions civil servants often ask me, but if you have any others, please leave a comment below. While there are a number of combat roles, the Reserves also offer all sorts of different and exciting roles across the three services. What's more, all these roles will help you develop new skills as well as enhance your leadership capability. Depending on what you decide to do in the Reserves, there are some roles that will match the skills you use in carrying out your Civil Service job. So, you can either join the Reserves to take a 'busman's holiday' or try something completely new. Either way, there will certainly be a lot of transferable skills that will help you to develop both as an individual and as a civil servant. The Reserves need recruits from all backgrounds. Most units recruit both women and men, and almost all roles are open to both sexes. Your uniform and equipment are free of charge, and travel costs are reimbursed to you. Even better, you get paid to be a Reservist on top of your Civil Service salary and get an annual tax-exempt training bounty when you have successfully completed your training commitment. The time commitment depends on what type of unit you join. It can be as little as two weekends plus a two-week annual training period. If you can give more time, there are numerous ways of getting involved and most people don’t find the training any more time-consuming than many other spare-time activities. As a civil servant, your department will give you a minimum of 10 days special paid leave for the two-week annual training period – with some departments already providing a minimum of 15 days and others moving towards this in early 2015. Reserves can be recruited up until they’re 49, depending on the service and the role. And there are even higher age limits for professional and specialist applicants. The application and enlistment process can take up to a few months. However, many units will allow you to carry out limited training during this time. Many roles need only moderate fitness, and all training is progressive, so you will be helped to get to the required level over time. Some roles do require a considerably higher level of fitness, but again training is progressive. 10. You can change your mind! It’s easy to transfer to another unit if you fancy a change or move to another part of the country. Transferring between the services takes a little longer, and you can leave the Reserves whenever you want to if you don't enjoy it. To find out more surprising facts about the Reserves and how it would benefit you and your teams, come along to The Reserves Experience at the Old War Office on Whitehall on January 28th and 29th. Register for a ticket now. Isn't it odd that you can get 10 days paid special leave for this but nothing when it comes to needing time to look after sick relatives; think the department needs to familiarise itself with the need to understand the needs of ALL employees not just those that fit the Government's desire to fill the gap left by military cutbacks. As a Cadet Force Adult Volunteer for over 30 years I believe this organisation is overlooked within the Civil Service. Reserves have an important role but so do the MOD Cadet Forces. We learning most of the same skills as a reservist but also spend time leading and developing youth people working to the promote the Governments 'Big Society'. Young people are able to partake in a challenging, adventurous and progressive organisation through teamwork. Both the Reserves and Cadet Forces provide a valued service to Queen, Country and Community especially in these difficult times. Whilst I fully agree with the support given to Reservists in the Armed Forces this highlights the issue of no support given by the Civil Service to those of us for example, act as “Reservists” to the Ambulance Service in times of emergency and are therefore effectively on-call 24/7. We support events across the country voluntarily so they can go ahead (enabling money to be put into the economy) and as a result maintain our skills for when the call comes in time of emergency (bombs, floods and snow – all of these are recent emergencies that I know about just in my own rural county). However, on top of this we still have to train weekly and this alone equates to effectively an additional 12 “working days” a year at least. “Reservists” like myself, though, have to balance fulltime jobs and these commitments without currently having any support from the system. Last winter I was placed on standby on multiple occasions, fortunately or unfortunately I wasn’t called out. However, if I had, once I had used the normal one days paid special leave allowance, I was told my Annual Leave / Flexi would almost certainly have to take the hit. 1. Do you believe there is a case for the Civil Service to look at the wider picture regarding support for “Reservists” for the Emergency Services? 2. Can you hand on heart say it is fair on volunteers to potentially have their hard earned annual leave / flexi swallowed up in the event of local / national emergencies? 2. Sufficient levels of paid special leave which would at least cover the vast proportion of any call outs. "And there are even higher age limits for professional and specialist applicants" - are you able to elaborate and give examples of what these "professional and specialist" opportunities are for the over 49 category? No doubt Chris, Olaf and Andrew have gained a great deal personally as Reservists, and no doubt much of what they has learnt is of value in their Civil Service work. However I wish to say out that no negative aspects of life as a Reservist have been pointed out. 4. The legacy of the Army’s involvement in Iraq and Afghanistan, and the loss of life suffered both by the Army itself and many thousands more non-combatant civilians are abhorrent to me and many others. The legacy of depleted uranium continues. The Government White Paper "Reserves in the Future Forces 2020 – Valuable and Valued" tells us that the aim is to increase the reserve from the current 29,291 to 34,900. I also learn that a reservist may be called up for "up to 1 year in 5". It is also the case that reservists will be expected to perform exactly the same tasks as regular soldiers. From a cursory inspection of the website there appears to be little reference to after care of personnel after leaving the Armed Forces. It is well known that the prisons hold a high number of former soldiers. Many former soldiers suffer from post traumatic stress, which can result in dysfynctional lifestyles, depression, violence and suicide. And these problems affect not just the individuals concerned but their family and friends too, and possibly others who may be victims of their actions. My comments are in no way a criticism of Chris, Olaf and Andrew as individuals, or a disparagement of their achievements. However I do have an issue that there are negative aspects to the Reserves which I feel have not been pointed out. As this blog has been sent around the whole Civil Service, as far as I know, I do honestly feel that balance is required when items of this nature are circulated. It is the second time that Olaf has been given this opportunity (see "Discover why life in the Reserves is special". Further to Barry's comment, I agree entirely. Why can't there be a system of "Reservists" purely for civilian matters in the UK, or perhaps further afield too? This would be a cadre of people completely separate from the Armed Forces. The types of skills developed would be useful to the Civil Service. I'm thinking of dealing with natural disasters such as flood, drought or fire. Also manmade problems such as chemical spillage or radiation leakage. And clearly there is a compelling need for the NHS and social care in general to be helped when under extreme duress - such as in winter. Isn't that a major concern for all of us? I was a member of the RNR in the early 1990's and it was an enjoyable experience. Unlike current reservists I only received 6 days special leave to cover the 2 week annual training period having to use 4 days annual leave to cover the rest of the time. Rob, as a former reservist, I can assure you that people would , as a matter of course consider all the above before signing. In my day it was the threat of the IRA which was always in the back of our minds. The majority of regiment sat out the Gulf War, but I believe there no illusions that , if required, one would be called up, even in the Cold War era. For a real sense of balance from a practical point of view, I would say apart from the obvious risks , there are these things to consider. Pay: It may not pay as well as your day job. So if you are likely to go on an extended tour of duty, know what you need to do to top up your finances. For me the frequent availability of overtime in my main job at that time was a major incentive to leave. The effect of being away for long periods on your family. Combat units , quite rightly, will expect you to offer more than the minimum time commitment. Although the kit is free, in practice you will end up purchasing kit for practical reasons , whether is is more, or better webbing, spare uniform/battledress and boots , including the untouched ready polished pair because you don't want to waste time polishing them for hours on end. As an ex Regular soldier of 34 years now a Civil Servant I joined the Reserves on leaving the Regulars and deployed to Afghanistan in 2009/10. Rob Davies is correct in suggesting that anyone considering joining should do their homework first but I have received excellent support both during and after deployment and fully enjoy the commitment although I have not had the opportunity to kill anyone, well not intentionally anyway. I do find it strange that as Civil Servants, regardless of departments we are here to support the Goverment policies, whoever is in power at the time so if you feel so strongly abouts its decisions then perhaps reconsideration of employment is due? Wow , i had no idea my job ultimatley would lead to someone being shot? Or that i would have to decide if i was going to shoot someone.... I work for the Department of work and pensions, i do not always agree with the working practice or policy but so far has not affected my decision to leave.....or shoot anyone! Perhaps in this day of recession it is a case of needs must......for my pay...again not the need to shoot someone. On a more serious note, I am thinking of joining the reservists but am vey glad for the points that have been raised in helping to come to an informed decision. I agree we need to help when required but again yes we have to look at why we would go to war and for what reasons we are committing ourselves, so thank you all for your points of view. I see the plan now; cut my pay and make things so bad that being shot at seems preferable. Anyone thinking of joining the Reserves should go for one of the open evenings all the units hold on a regular basis, I am ex regular RN and now RNR, I was mobilised last year to Bahrain for nine months, six months in post the rest of the time training and leave. It does place a strain on family life and work did appeal my mobilisation and delayed me going but the rewards are tremendous and a sense of self satisfaction that is difficult to find elsewhere. Hey what about the support for the Police Special Constabulary? The Police Specials are also volunteers who give up their 'free' time to help the community but WITHOUT PAY and other benefits of special paid leave etc! They work as part of the Energency Services and also benefit with the skills not normally gained else where but are useful with in the Civil Service. They should be also included in the Civil Service policy on helping serve the community and the Country? time required of me when I left the Army in 1993, I served in the Light Infantry as a regular. Am I now to old to join the Reserve forces in a combat role.